The DJI S800 Spreading Wings HexaCopter is a professional HexaCopter designed with the commercial aerial photography (AP) and experienced model enthusiasts in mind. The S800 Spreading Wings has the advantage of an extended flight times with the ability to carry large payloads, with great stable flight when used in combination with the DJI Wookong-M multi-rotor autopilot system. With the Wookong M & S800 you can easily perform precise hovering, constant-speed cruise and autonomous flight plans with outstanding manoeuvrability. The Spreading Wings S800 has many great features that ensure the user experience is one of ease & rapid deployment in the field, the circuits from batteries to the electronic components in the frame, arms, PMU and camera gimbals are integrated in the centre frame plates, this reduces the possibility of malfunction & simplifies the wiring. 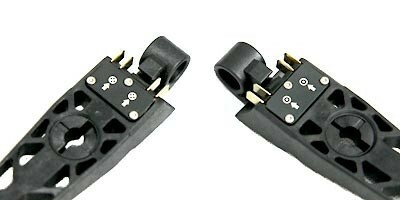 All the power and signal wires for the motors, ESC's and LED indicator are embed into arms, which makes the S800 frame & arms look very professional, there are no wires to route through the arms or pass along the outside of the arms found on other multi rotor HexaCopters. Special slot designs in the arms and Centre Frame with a locking system completely conceal contacts to the arms for the motors, this makes the overall design safe, reliable, and provides minimum disruption at the start and end of flights. Following on from the Simple steps needed to remove and replace the arms on the Spreading Wings, the S800 Landing skid breaks down into a convenient to carry and transport package. The landing skid is almost entirely constructed from light weight high strength carbon fiber material, which will support large weight loadings. High performance brushless motors fitted to the S800 are a special design for the DJI Spreading Wings which reduces the noise and vibration, while delivering smooth turning with improved stability and performance of the S800 HexaCopter. All the carbon fiber propellers have been tested to be perfectly balanced and are strictly selected to reduce the maintenance and extend the lifetime of the motors. 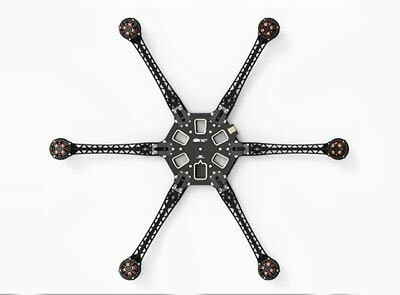 The carbon fiber propellers are, light weight, high efficiency and very strong for the best flight times and performance. There is a position reserved in the centre frame for the installation of the DJI Wookong M IMU, which is the recommended flight controller for use with the S800 HexaCopter. In addition to this feature there are signs on the slot of the centre frame which clearly shows the channel numbers of the WooKong-M IMU, which helps users to install the autopilot system quickly and correctly. The Spreading Wings S800 HexaCopter by DJI Innovations is the professionals choice for an aerial photography platform. Designed for easy and quick deployment with removable arms and skid for easy transportation. Please note: Camera mount shown in the image is not included with the frame, for illustration only. Silver case shown in video is not supplied with the DJI Spreading Wings S800 kit.